Elma Cottage01263 715779work01603 870304fax Self-cateringThis cottage is about three hundred years old and steeped in history, situated by the North Norfolk Coast, which provides a great selection of nature reserves, coastal paths, countryside walks, pubs and restaurants. This property provides modern furnishings, utilities and comfortable furniture and is well-suited to families and groups. Guests can bring their bicycles and explore some wonderful cycle routes. • Notes: Dogs are not allowed upstairs and should be left in the inner hall and utility room if left unattended. The inner hall is an ideal area for wet dogs. Pets are not allowed in the Annexe at any time. Damage caused by unattended dogs should be paid for. During the low season parties of five or less will receive a £150 discount off the full week price, the annexe is not included in this offer. Some pillows and cushions are feather filled. Some pillows and cushions are feather filled. A view of Elma Cottage on a typical summers day. 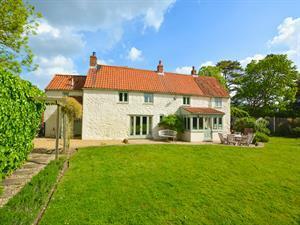 This cottage is about three hundred years old and steeped in history, situated by the North Norfolk Coast, which provides a great selection of nature reserves, coastal paths, countryside walks, pubs and restaurants. This property provides modern furnishings, utilities and comfortable furniture and is well-suited to families and groups. Guests can bring their bicycles and explore some wonderful cycle routes.